The betting brand known for delivering big stunts - often involving pants - is marking its 30th anniversary this week, so we've asked Paul Mallon to choose his favourite work. In the past 12 months, we’ve worked hard to develop stunt ideas and flesh them out to work through print and digital ads, integrate the creative into our products, CRM and retail estate – it’s a long way from just plonking something on social. There are three campaigns from the past five years that centred on LGBT+ causes, which are among our strongest work. "Rainbow laces" needed a very direct message designed for a football audience (thinking about the "Inbetweeners generation" at the time). It wasn’t about preaching to the converted. "Come out and play" this year was the tagline for our sponsorship of the Brighton Pride festival, with copy aimed to show LGBT+ football players that society was ready for them. There’s still no players ‘out’ in the top tiers of the male professional game. One real measure of success is people taking the effort to share an ad on social. 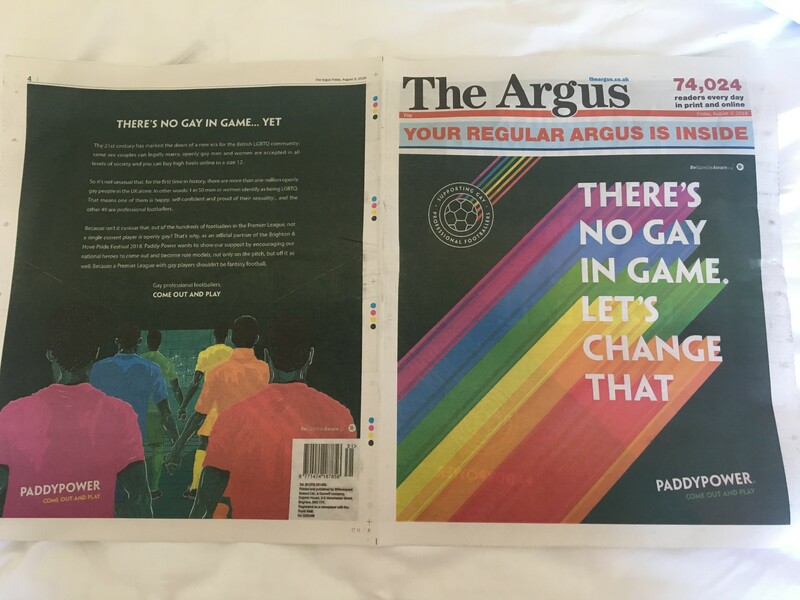 In the case of this Pride sponsorship, our full-page ads in The Guardian, the Brighton Argus and Metro were being shared by people on the Friday before the event and were very copy-driven. It was a brave approach and kudos to Officer & Gentleman, which nailed this brief – a multi-dimensional beast. 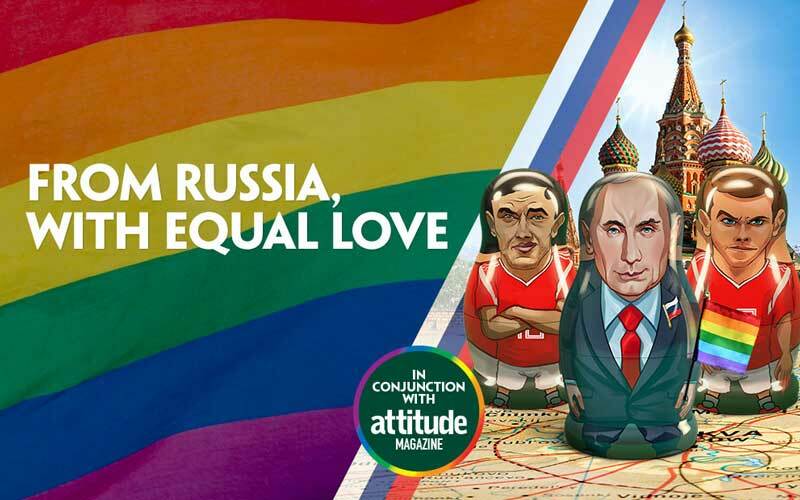 The "Rainbow Russians" campaign during the World Cup, hatched with Synergy, was just genius – making accidental allies of the homophobic hosts to raise £170,000 for LGBT+ causes with the Attitude Foundation. In 2012, with Europe on the verge of a spanking, we propelled customers’ tweets into the skies above Medinah, trolling Team USA and Tiger Woods in particular. Europe came back to win – of course we’re not saying we inspired that comeback. But we’re not saying we didn’t, either. 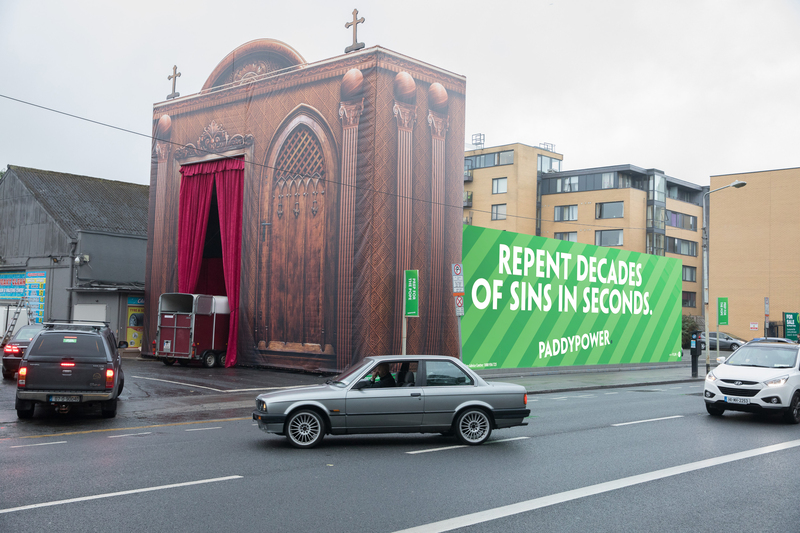 The original idea was just to have Paddy Power in the sky tweets, but this showed the hybrid approach we take to most things – bringing on an idea and making it bigger and bolder, with internal teams working closely with agencies. The best bit? The sky tweets were captured live on Sky as Rory McIlroy asked for his phone to record them. It’s very hard to steal the oxygen from Donald Trump. It’s very risky taking him on with creative work. The South Park creators hit the nail on the head when they said "Nothing is funnier than a monkey running into a wall", or words to that effect. 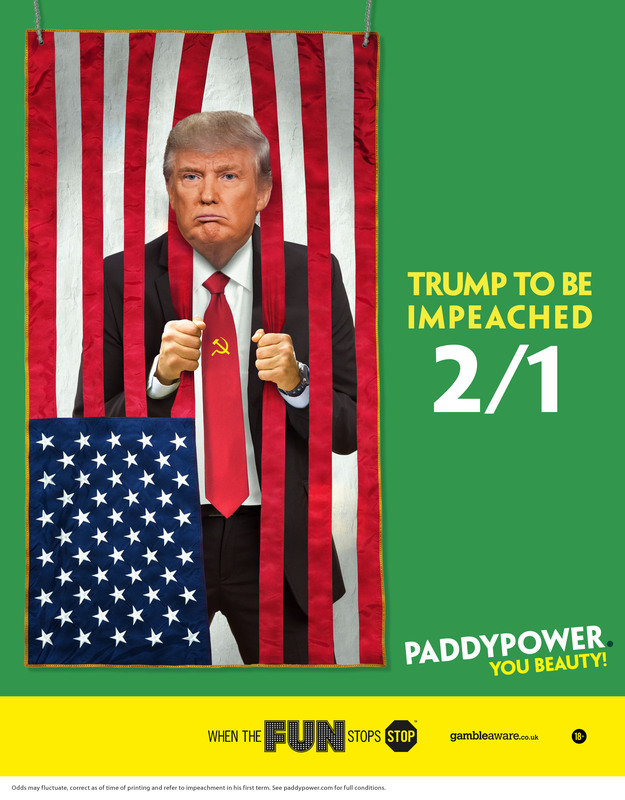 But this ad, which ran as a full page in The Guardian, was sharp, visually stunning and probably as timeless as any Trump-related creative in the past 12 months. This campaign was designed to coincide with the visit of Pope Francis to Dublin this year (the first visit of a pope to the city since 1979). It was a brilliant, open process between an agency we’ve used since day one and our internal teams – taking inspiration, too, from the church’s own drive-through scheme for Ash Wednesday. We wanted this to be more Father Ted in its tone than obnoxious or mocking anyone’s faith, and it landed like a dream in the news vacuum before God’s right hand man touched down in Dublin. Punching up isn’t easy these days, but taking aim at drunken toffs at one of Britain’s most celebrated racing festivals, the Royal Ascot, was a very enjoyable way to do it. The first draft of the script from Taylor Herring absolutely nailed it in terms of timing (short), tone and just enough one-liners. It was again designed to land in the "white space" before racing got serious. We love the idea of doing a big stunt or advertising activation before the sport kicks off. Messing with people’s love of sport isn’t our idea of fun. In terms of planning, this was a monster – taking longer than a year. It’s not easy to track down a real polar bear. A big learning from this was that if you’re borrowing ideas from the past (we’d done a famous hoax for the Amazon "Shave the rainforest" stunt in 2014), then you’ve got to bring plenty of new elements to the table. With this, yes, we worked with a real polar bear – but the element that really exploded it was doing traditional advertising on it in the form of a newspaper wraparound on Metro, using real but grainy footage from the shoot itself. It was probably a little too complex in its activation, but that’s something we’ve tried to learn from since. A classic billboard from the 2000s. 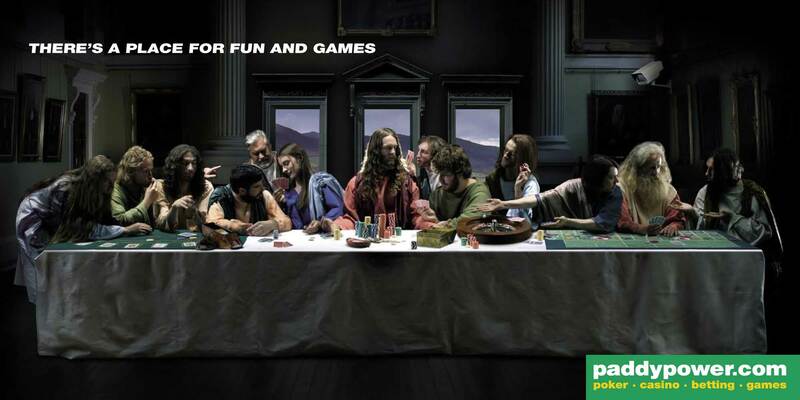 This was based on Leonardo da Vinci’s The Last Supper and used to advertise Paddy Power’s gaming channels at the time, but quickly fell foul of advertising authorities. We had to haul it down, replacing it with a message: "There’s a place for fun and games, but this isn’t it." You’ve got to be able to take some flak on the chin and our brand is well used to that. 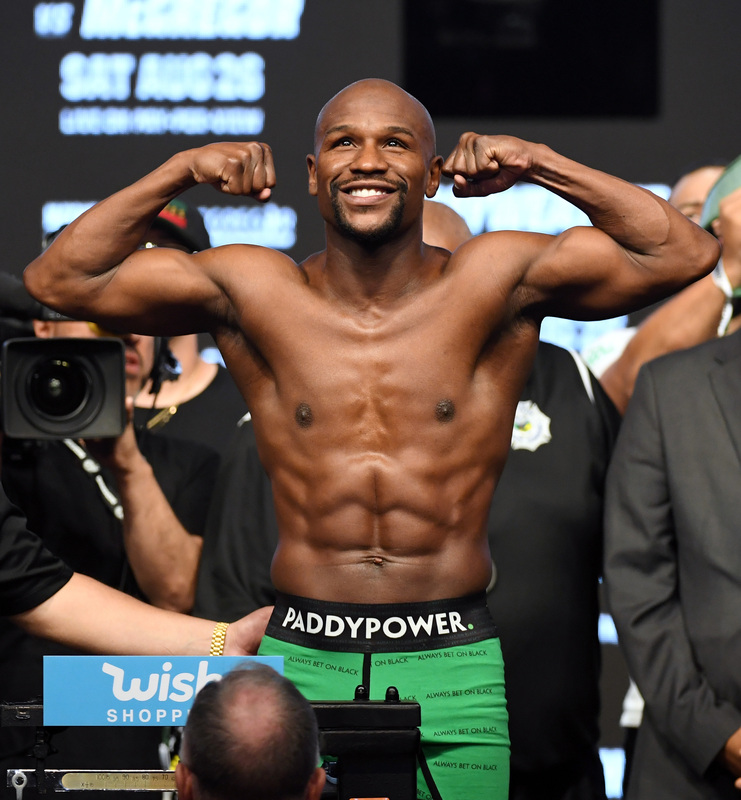 But backing the other side in this fight – sponsoring Mayweather for his fight against Irish hero Conor McGregor – was definitely on the riskier side of the scale. Our social media team received a record amount of snake emojis, but going against the grain or taking a different side is a classic way of getting attention and cut-through, especially when it was for the biggest sports event of the year.